For more reviews, please visit my TOURS page and you will find out what my guests wrote about any of my private guided tours of Florence. Eliza was fabulous. Knowledgeable, friendly, and able to engage and keep the interest of two teenagers, while making sure we saw not only the important historical sights of Florence, but also the best gelato shops and a really good place for Florentine Steak. Highly recommended. Eliza was exceptional, absolutely the perfect match for my (adult) daughter and me, celebrating her recent doctorate completion! We spent a delightful three hours ‘walking and talking’ the city center, and finished with ideal restaurant recommendations and suggestions for our final day of experiencing Florence. Eliza went way beyond our expectations for this shore excursion. She coordinated perfectly with our driver for one thing. But it was her knowledge and enthusiasm for art and history that made for a really exceptional tour. She also knew the perfect place to have lunch that was ‘local’ and not a place for tour buses or on the tourist walkways. The food was delicious as was the ambiance with our Italian peers. We were 200% happy with the tour she gave us. Our family of 5 (including 3 teenagers) had a wonderful full day tour experience in Florence with Eliza in Dec 2014. She was engaging and knowledgeable and quickly built a great rapport with our children, who didn’t grumble despite a few museum visits. Eliza met us at our apartment and planned the tour to bring us back again, making sure we hit all the highlights along the way. She was full of tips for shopping, dining and further exploring this wonderful city. This booking was most delightful. Our guide, Eliza, arranged our transportation (Claudio) from Luverne to Florence, and this worked very well. Eliza accomodated our changing desires with good grace. -at one point there were to have been 3 in our party – then 5. She rolled with the punches. 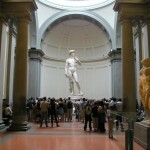 And she saw to it that we got to see the highlight of going in to Florence – the David. I would seek her out again on our next trip. Thank you, Eliza. You couldn’t ask for a better guide than Eliza! She is gracious, knowledgeable, and professional! She is very well versed on world issues, and made talking to her like talking to an old friend! Her tours thru the 2 major museums brought history and art alive by looking at the highlights of the museums. Her flexibility and familiarity with the area made the tour go very smoothly. After using 5 guides in Europe, we actually still miss Eliza, and would absolutely use her again for more sites in Florence! Eliza was amazing! We cannot say enough about her. Both my husband and I and our 2 children – ages 8 and 11 – learned a ton AND had a great time seeing Florence with Eliza. She is extremely knowledgeable and engaging. She was able to make the tour attractive to the kids and to the adults at the same time, and explained things in a fascinating way. She also put together a perfect itinerary for us. She is a wonderful guide and a lovely person. We feel truly fortunate to have had her as our guide!!! Wow! The whole family, myself, husband, 18 y.o. son & 17 y.o. daughter enjoyed Eliza so much! We had a full-day with her (2 gelato stops & lunch) we learned so much about the Florentine history, art and the current political issues of Italy. My son’s favorite Italian City is Florence! It was a very casual experience that all can enjoy even my daughter as it was her first time hearing some of artist’s names and seeing their artworks. Best tour guide in Florence! Yes, have had others. Book with Eliza! Had a great time with Eliza and saw all of the highlights in the great city of Florence. Her intimate knowledge of the city and museums allowed us to bypass almost all tourist congestion even on one of the busier days of the season. Probably would have taken us 2-3 days to see the same amount on our own and we wouldn’t know all the great stories behind the buildings and art. Eliza could not have been more wonderful. She was there at the appointed time and went out of her way to accommodate my walking limitations. Despite the oppressive heat she found us shade, rested when we needed to and gave us the tour of a lifetime. Her knowledge of the history and art of this fabulous city is exceeded only by her pleasant demeanor and attention to small details that made our trip one in a million. She was very accommodating of the groups needs ( a few had difficulty waking), extremely knowledgeable presentation and excellent command of English. She selected excellent places for lunch and Gelato, and was very enthusiastic. She made the tour very interesting by adding historical details about Michelangelo’s David not commonly known. Our tour of Florence with Eliza was incredible and we absolutely recommend her as a guide – she collected us from our hotel, she tailored the tour to our interests such as sights from the movie A Room with a View, major Florence locations and smaller, gorgeous sights /shops that we wouldn’t have found without her. Eliza’s knowledge and passion for history and art in Florence is outstanding and walking the city with her was like spending time with a lovely friend who we’d known for years. We booked Eliza for a half day tour in Florence. This was part of our 2 week stay in parts of Italy, Czech Republic, Austria and Germany. Our 1/2 day with Eliza was one of our favorite parts of the entire 2 weeks! We customized our tour with her. We wanted to see the Uffizi and Accademia, but we didn’t want to spend all of our time in museums, we wanted to get a little bit of the local flavor of this beautiful city. Eliza accomplished both for us. Eliza is a sweet young lady; highest recommendations. There are no words to describe the most wonderful day we had in Florence because of Eliza in our Segway Tour. She went over and beyond the call of duty to create extreme perfection. Not only was she knowledgeable about the history and routes of Florence, but she also gave us information that we would not have gotten any other way. She was the tour guide that kept on giving even after she was no longer with us…recommending places to visit and dine. I can attest she was the best tour guide ever! !